Arrival at Chiang Mai, meet you at airport or hotel by our local tour guide. Drive up the serpentine road to the magnificently situated Wat Doi Suthep. Perched on a forested mountain, this most sacred of Chiang Mai’s temples (3,280 ft.) provides a superb view over the city, as well as a wealth of images and frescos. You then pass the city’s biggest market and head to Wat Chedi Luang where the Emerald Buddha was once enshrined. Visit Wat Phra Sing, famous a 1,500-year old Buddha image. Continue to Wat Chiang Man, which features typical northern Thai temple architecture. Later back to the hotel. Drive from Chiang Mai City to Mae Rim. Start with a visit to an elephant camp. After seeing the admirable and intelligent animals bathing and working, you can take an hour ride through the forest on the elephant back. Then visit Hmong Nong Hoi Mai hilltribe village and The Royal Project. On the way back catch a glimpse of Queen Sirikit Botanic garden and orchid farm. Spend your nightlife in Chiang Mai. Drive to Chiang Rai about 3 hours. Visit Chiang Saen, the ancient capital of the Lanna Kingdom, and the Golden Triangle, where Thai-Myanmar-Laos meet. At night free at Night Bazaar market, located in the middle of downtown, Chiangrai, which is a place for souvenirs and local products, with free cultural performances. Also more than forty restaurants. Over night stay in Chiang Rai. Enjoy your free time in Chiang Rai. Then you are transferred back to Chiang Mai by vehicle. After a break, give yourself a cultural and scenic treat in Chiang Mai and have an insight of this city. Enjoy your nightlife in Chiang Mai. Tour to visit local morning market. Continue to visit Wat Chong Kam, The beautiful Burmese style temple and the first temple in Mae Hong son build by Burmese, and transfer to the pier. An hour boating along Pai River to hill tribe village to visit Padong Long Neck tribal, where the women are famous for their extraordinary practice of stretching their necks with large metal spiral collars. 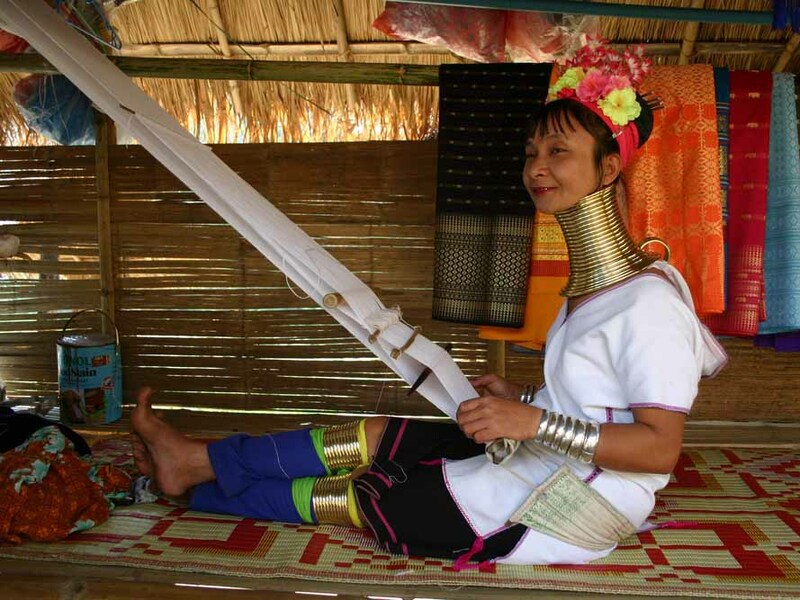 They are know as the Long Neck Tribal. Visit Fish Cave. Over night stay in Mae Hong Son. Enjoy your leisure time in Mae Hong Son until drive back to Chiang Mai. The rest of the day is free for you. You can have an insight of Chiang Mai, giving yourself a cultural and scenic treat in this city. Later enjoy your nightlife at your proposal. Set out for Lampoon, where you can go back to the region’s historic-legendary beginnings. Queen Chamadevi, the north’s greatest founding figure, brought Buddhism and an advanced culture from Lopburi in central Thailand in 8th Century. 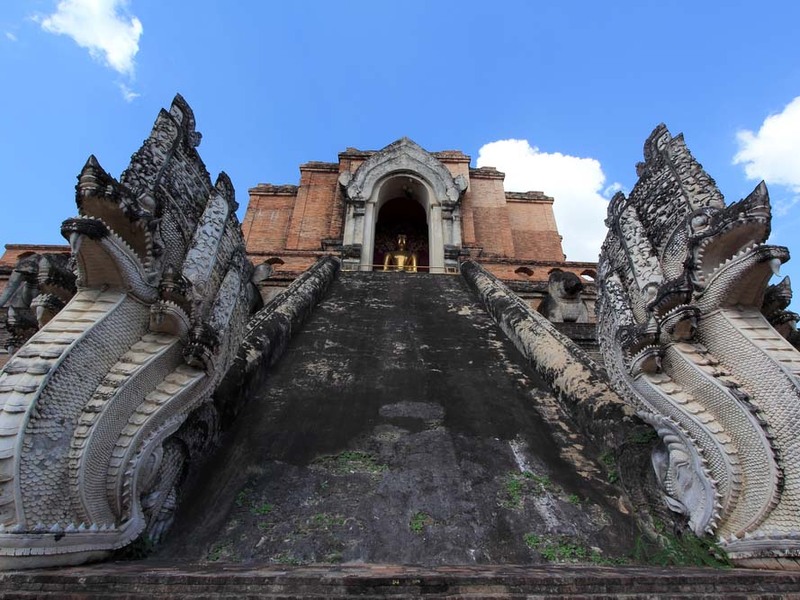 Here at her capital, you will have a visit at one of the region’s most venerated temples, Wat Haripoonchai (founded 1157), and then look around the temple especially dedicated to the Queen, Wat Chamadevi. Afternoon visit a silk factory at Sankampaeng to see the silk manufacturing process from worm to weaver and watch the pretty girls of Bor Sarng making their brilliantly-colored parasols. Later back to Chiang Mai. Enjoy your free leisure time in Chiang Mai till departure for your next destination.